Ballistic results for this propellant show it appropriate for both pistol and rifle cartridges that incorporate a near straight-walled cartridge case. 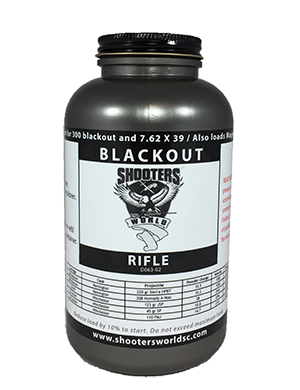 The propellant gas generation rate is appropriate for .300 Blackout, 7.62×39, .30-30, .22 Hornet, as well as many straight-walled large pistol and rifle cartridges where rapid transformation from powder to gas is desired. It is similar in burn speed to Accurate 1680®. A spherical propellant, it meters through charge plates consistently and will flow well in a high-speed loader. It contains a level of flash suppression, incorporated into the propellant. This propellant is a canister form of Lovex D063 reloading propellant. Ballistic load data using European CIP test methods and standards for D063 propellant is available here.